After many hours of creating my line drawing the time has come to begin my under wash. This stage in the process makes me a nervous wreck! One wrong move and all of the hours you have spent on the drawing can be ruined in 30 seconds by not taking the correct steps beforehand. 1. Proper masking- I typically use drafting tape to mask the outside edges of the building and areas where I do not want the under wash color such as the windows. I rarely use masking fluid but sometimes it comes in handy for small areas where you can not use tape. I cover the ends of the cornices with tape as well and carefully cut out the shape with a very sharp exacto blade. Make sure that you do not apply too much pressure or it will cut into your watercolor paper. 2. Color Palette: It is important to create a color study or palette beforehand. 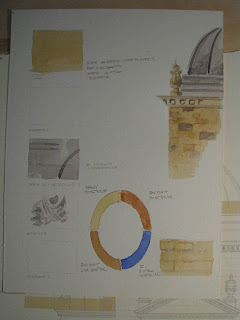 I like to figure out what the under wash color will look like, the color of the stone work, shadows, roof, and statuary. 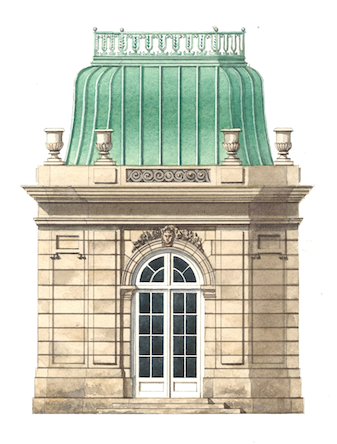 I even draw a small sketch showing a section of the building so I can experiment with color. Make sure you have enough of your paint colors ahead of time. It is no fun to be in the middle of your painting and realize you don't have enough of a necessary color. 3. Think ahead of time about the sequence of steps in your painting. You have to think and react very quickly while painting because the medium is so unforgiving. So think about every step before you proceed. Think about which washes will need to be completely dry before you move on to the next wash. You don't want certain areas to bleed together. 4. Make sure your lighting is good and take into consideration the temperature or dryness in the room. The temperature and humidity in the room can affect your drying time. 5. Keep plenty of paper towels nearby for blotting and cleaning up any unexpected mistakes. 6. Having too much coffee or cocktails is usually not a good idea. You want a steady hand as you can imagine. Hey I love to have a glass of wine in the evening but I keep it to minimum. 7. Have fun! Enjoy the process and the beauty of the medium you are working with. For the under wash I use a very diluted mix of yellow ocher and a touch of burnt umber. I am using a wet on dry flat wash working from left to right as I work my way down to the bottom. You will need to reload your brush several times during the wash. If there is any excess at the bottom just blot your brush on your paper towel and wipe away the excess. This is one of the most important washes to get right because the color and consistency will effect all of the washes you put on top of it. Because there is so much variation in the stonework I like to pick out some of the stones after the under wash is dry by repainting with the same yellow ocher and burnt umber mix. 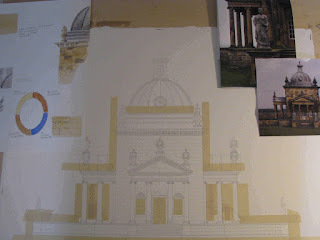 From here I will be working on creating the contrasting values and the details, which I will include in the next blog. There is always that point of no return...lol...can't wait for the next step. I'm glad you showed your process work...that's the magic to me. I am so pleased to see your blog and your spectacular work. I always knew you were talented,not to mention such a nice person, but it is such a pleasure to see the awesome work you do. Michael, You are absolutely meticulous and your waterclors are profound. It is a medium I have not mastered. I am trying wanter colors w Prismacolor pencels though. What a privileged insight into your art practice, Michael thank you! This is a brilliant series of posts in achieving the Temple of The Four Winds and I have taken lots of notes. I am making you a favourite so that I don't miss anything now. How odd, I thought I had commented ages ago to thank you for generously sharing the secrets of your art practice with us. I've found the evolution of this project useful and fascinating.